PLEASE CLICK IMAGE TO VIEW - FINE 7MM REVOLVER BY EUGENE LEFAUCHEUX AND RETAILED BY CLAUDIN A PARIS - with 9 cm rifled and sighted barrel, hexagonal at the breach ans signed 'Fd, Claudin Brevete a Paris' and on the left hand side of the breach LF19157, high quality engraved open frame with floral and oak leaf designs, the flash plate decorated en-suite, folding trigger marked with 'E Lefaucheux Brevet', highly polished and figured two piece fruit-wood grips and folding trigger. 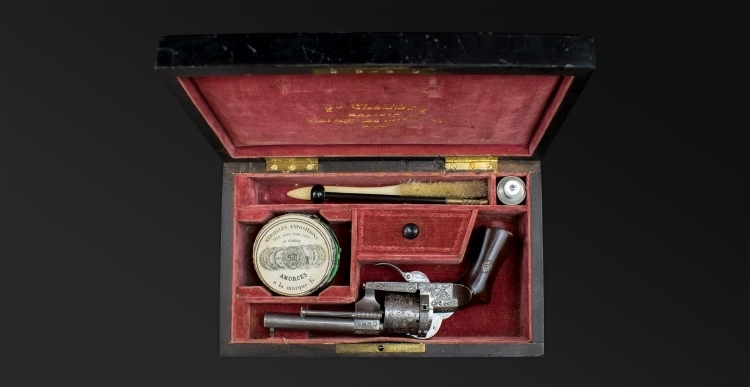 The revolver showing very little signs of use and in all respects in very near new condition and contained in it's original dark wood and velvet lined and compartmented case marked in gold inside the lid 'Fd Claudin Brevete, Boulevard des Italiens, 38 Paris'. and containing also a James Dixon oil bottle, cleaning rod, small cleaning brush and percussion cap tin containing an original box of 25, 7mm Lefaucheux rounds(now empty). The case interior in superb condition, the exterior with a few light marks and vacant white metal lid and key escutcheons, the key present and lock functional but the locking clasp absent. This is a very high quality revolver and will appeal to the serious enthusiast of Lefaucheux weapons. Eugene Lefaucheux born in Paris on 14th Sept 1832 and died in Cannes 24 March 1892, the son of Casimir Lefaucheux , gunsmith and inventor of the system/cartridge that bore his name. This is a genuine Lefaucheux and not a belgium copy.